Thus ends my trip to Utah. 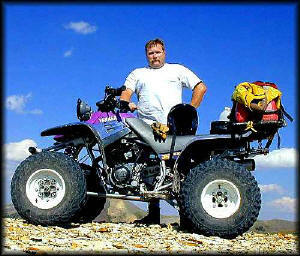 I had a blast, and if you are an ATV enthusiast I recommend you check out Utah. Just pack your trash out, don't carve up the trees, ride safe and do not endanger yourself or anybody else, and you will get along well with everybody you meet. For some reason, this is one of my favorite pics. I was looking down at Marysvale from the lower west side of the semi-arid valley it lies in in. I had walked out to the edge leaving the bike behind, patiently waiting. The picture makes it look stark, as though you are in the never-never land (you should never go there because if you do you might never come back). There really was a small trail up to where I parked though. 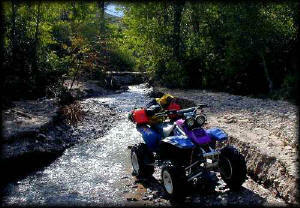 As for my ATVs, the two warriors I brought along absolutely rocked! I am so impressed with the fact that they go just about anywhere or do anything. Most of the ATV's I saw out here were monstrous 4x4's, which made my Warriors pale in comparison. But you know what, I had so much fun it didn't matter. They always got me where I wanted to go, and carried all that I put on them. I couldn't have asked for more. Yep, I can't wait to do it again next year! Marysvale.org One of many towns the Paiute runs through. 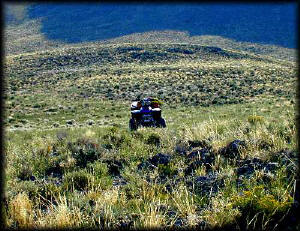 Utah ATV Trails Great info on all the best trails in Utah! The excellent ATVUtah site about the Paiute and other places in Utah. Thanks for visiting. I hope you had as much fun looking at the pictures as I did when I made this page. Send me an email if you have any questions I might answer, from either of the main pages below.